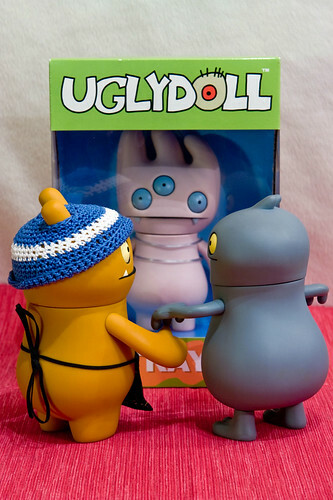 Adventures In Uglyworld: Uglyworld #234 - "Is It An Early Xmas Present For Us?" Uglyworld #234 - "Is It An Early Xmas Present For Us?" Uglyworld #234 - "Is It An Early Xmas Present For Us? ", originally uploaded by www.bazpics.com. Wage and Babo had heard me answer the door earlier this evening and wondered who was there and more imporantly what they wanted (i.e. had they brought anything interesting, or tasty for that matter for them to "take care of" for me). I told them that it was only some local kids selling homemade biscuits in order to give a better christmas to blind local rabbits (not sure how they bought that story, but it seemed to work all the same). Later on I summoned Babo and Wage to the living room where I told them to stand perfectly still with their hands over their eyes. After catching them both peeking through their fingers a few times they finally did the job properly, and I placed something in front of them and then quickly got the camera ready and shouted "ok, open your eyes NOW!!!". The expressions on both of their faces as they turned to each other and shouted "TRAY" was simply priceless - as you can see in the photo they even held hands for a brief second or two amidst all of the excitement!! !